Start Moscow (Ararat Park Hyatt Hotel) N55º45.606' E037º37.277' 169 meters . 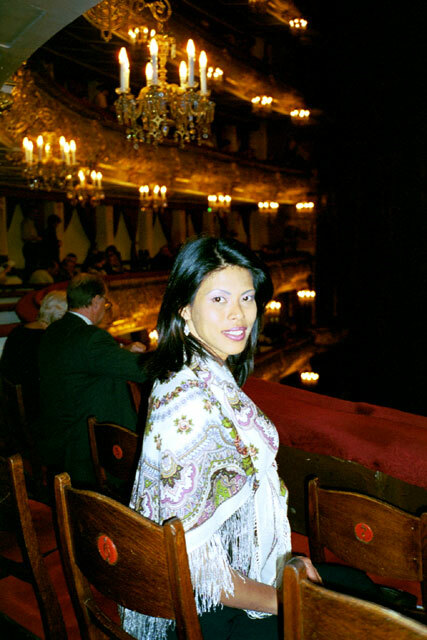 - Tour Kremlin . . . .
- Bolshoy Theater performance . . . . Finish Moscow (Ararat Park Hyatt Hotel) N55º45.606' E037º37.277' 169 meters . Weather: Cloudy, occasional sun in the afternoon and cool/cold. Cold in the evening and at night. 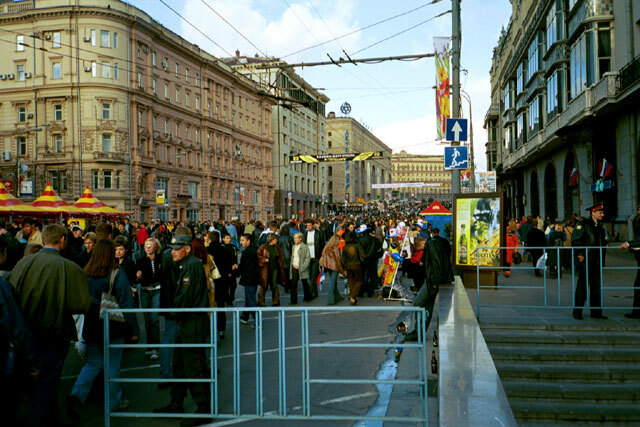 Today is Moscow Day - the day Moscow was founded and they want to celebrate this important day. So, many of the streets have been closed off to traffic and they have all sort of events going on. We sleep in and have a slow morning, enjoying our tea and coffee with orange juice and pastries. We finally get our act together and leave around 11 AM. The streets are truly closed and they have begun to set up stalls and security checkpoints. We spot a stand selling some pastries and other snack and go and pick up a few things. The streets are still quiet, so we wander down the middle of the road. 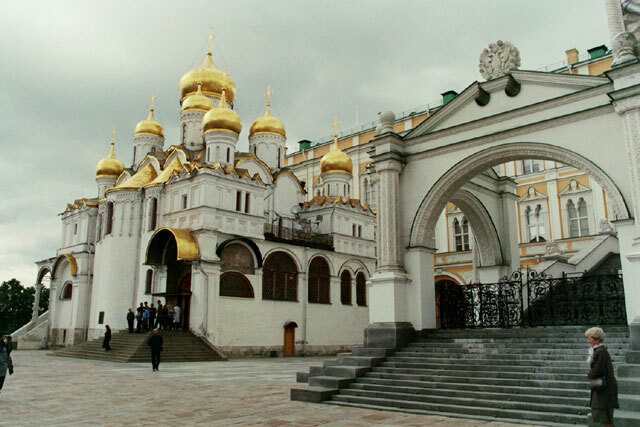 Our objective today is to visit the Kremlin and we arrive at the entrance only to find out that they will only let in people who are on a group tour with a local guide. What a pain. But of course, the enterprising Russians have taken advantage of this and there are a dozen or so locals standing around offering to act as our guide. But they want a ridiculous amount of money, so we pass. In the end, we talk to some other visitors and we get a group of six people together to see if we can bargain for a better group rate. We have some extensive discussions with one lady with whom we finally come to an agreement. We have been able to cut the amount per individual, but she is still making a killing. So, she gets us past the checkpoint and takes us to the ticket booth. First we have to drop off our bags at the coat check - no bags allowed inside. Fair enough, security is important, but they have turned it into a real money maker. It costs something like $3 per bag and then when you are thinking about ways to consolidate your stuff the lady calls out to you and shows you a laminated sign in English that spells out all the rules, including no putting bags inside another. It is amazing - one of the few places with information in English and only to tell you how they are going to screw you out of more money. Then when we get back from checking our bags, our ersatz tour guide tells us that she wants to increase our price. We look at her in disbelief. She really wants to increase the price by something like 25%. After some back-and-forth, we tell her to get lost. This is ridiculous. We are not going to fall for such blackmail. So, we decide to see if we can still get in - after all we are past the security checkpoint. In the end, we have no problems. 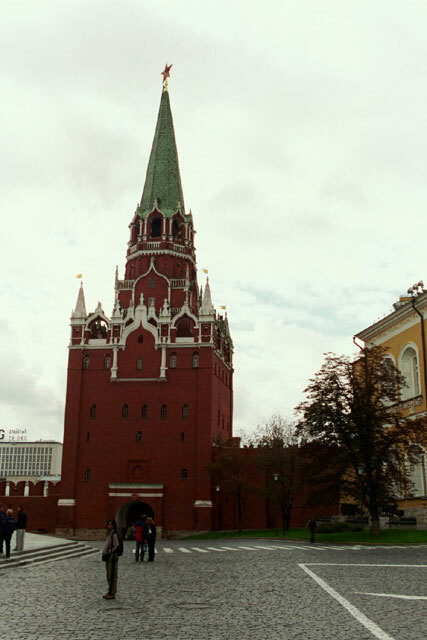 We are able to buy our tickets on our own and to enter the Kremlin. So, it works out for the best - we did not really want a guided tour where we are constrained to going at the group's pace. 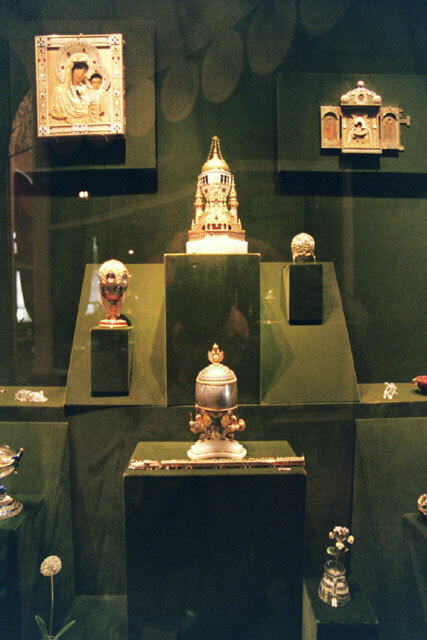 then the highlight, the collection of Faberge Eggs. 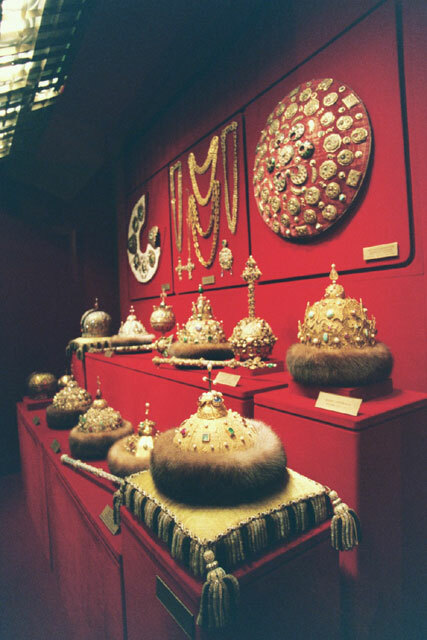 The collection is extensive and they are amazing. 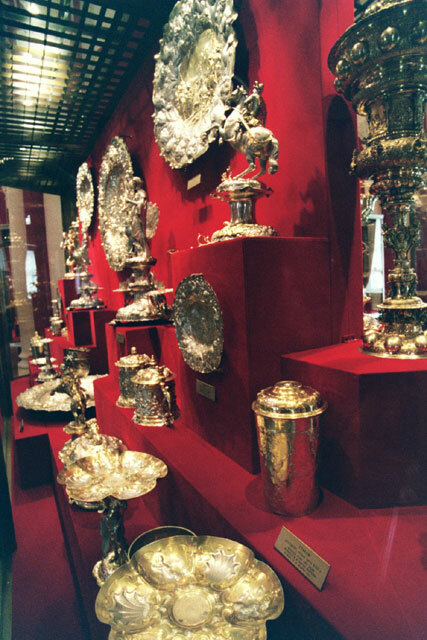 We could spend hours looking at them and examining every detail. 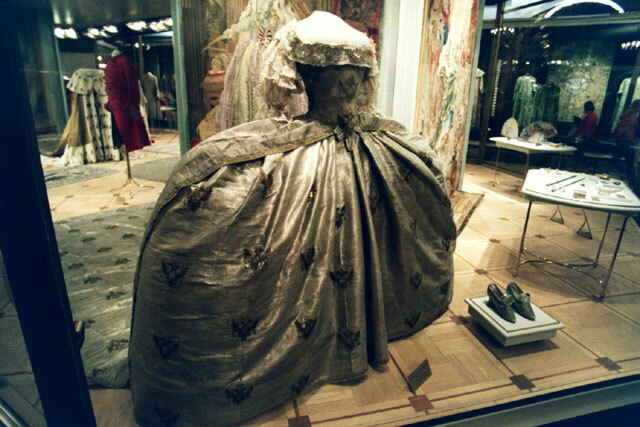 But just at that time, we were chased out of the museum by the ever watchful attendants. Seems like they have to break for lunch. Now it was time to explore the rest of the Kremlin that is open to the public. 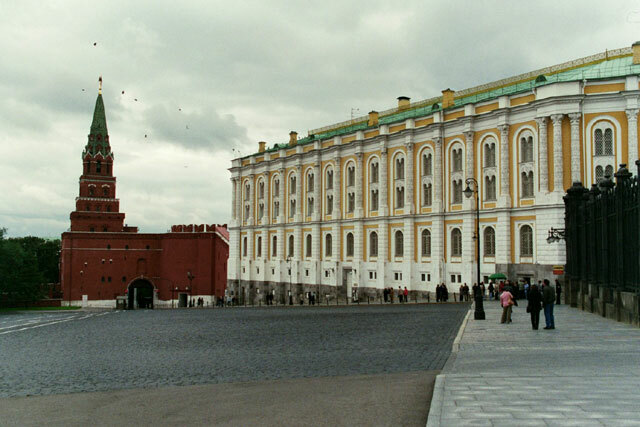 We walk past the exterior of the Great Kremlin Palace (closed to the public) and go and check out the exterior of the Faceted Palace. 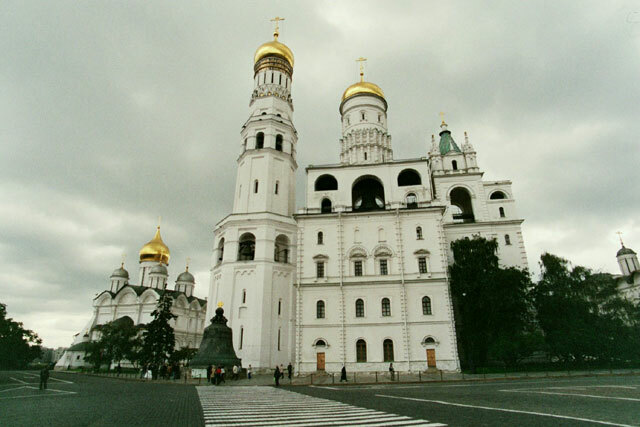 Next to it is the Cathedral of the Annunciation, which is open to the public. 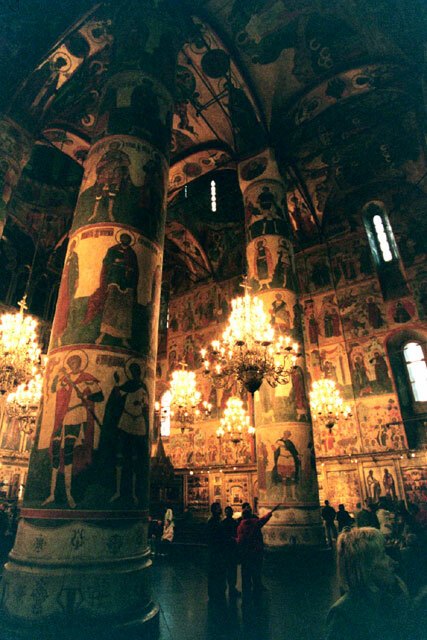 The walls and ceilings of this cathedral are covered with frescoes. 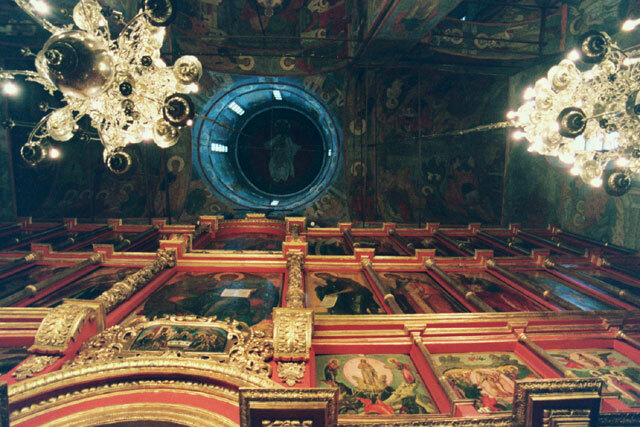 Especially impressive is the painting of Christ Pantocrator in the cupola. 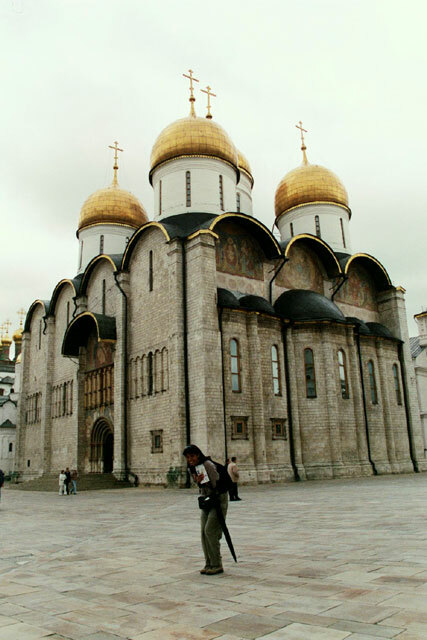 Then it is on to the Cathedral of the Archangel, burial place of the tsars and princes from 1340 onwards. The walls have some amazing frescoes. While we were in the cathedral, a quartet sang some hymns that just sounded exquisite under the dome. From here we went to the Cathedral of the Assumption, which is one of the highlights of the Kremlin. 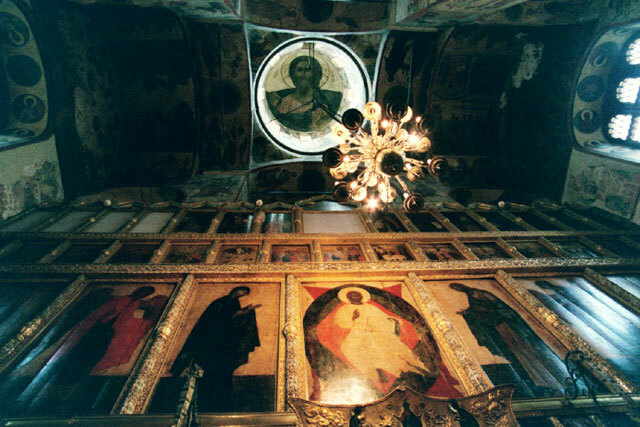 It is very richly decorated with frescoes, iconostasis, chandeliers, tombs and other items. 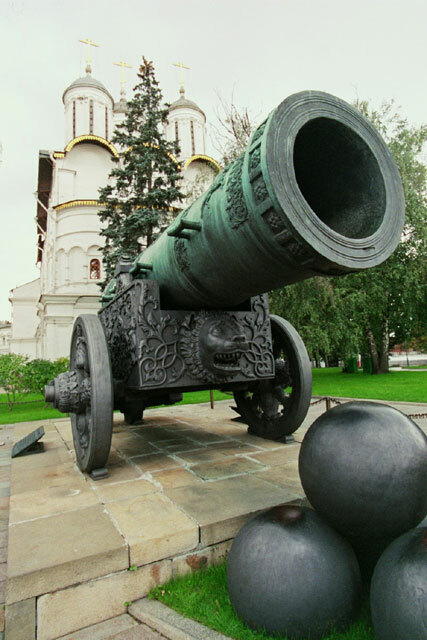 the Tsar cannon, cast in 1586 and weighing in at 40 tons. 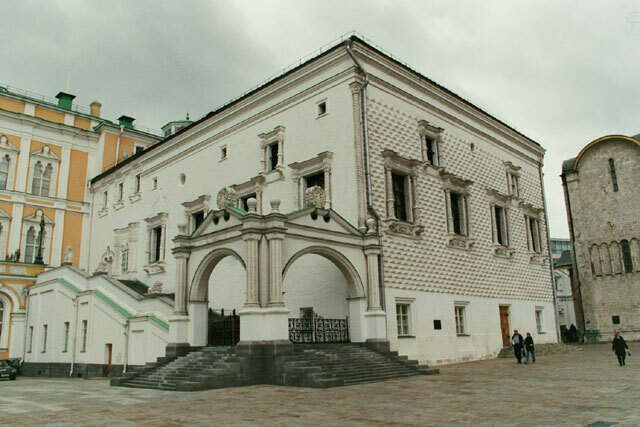 Our next stop was to visit the Patriarch's Palace, which was rebuilt and expanded for Patriarch Nixon in 1652-6 (who did not think it was large enough nor grand enough for him). 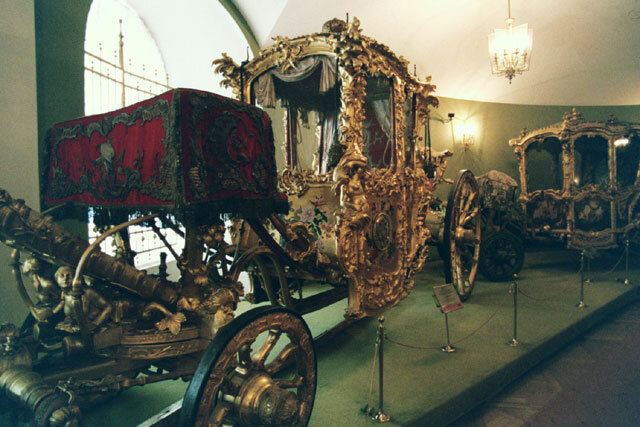 It is now a museum, which we spend a short time wandering about. Having pretty much seen everything in the Kremlin, we slowly head to the exit taking in the rest of the buildings that make up this ancient fortress. We leave the Kremlin through the gate which Napoleon marched through in triumph in 1812, only to leave defeated a month later. 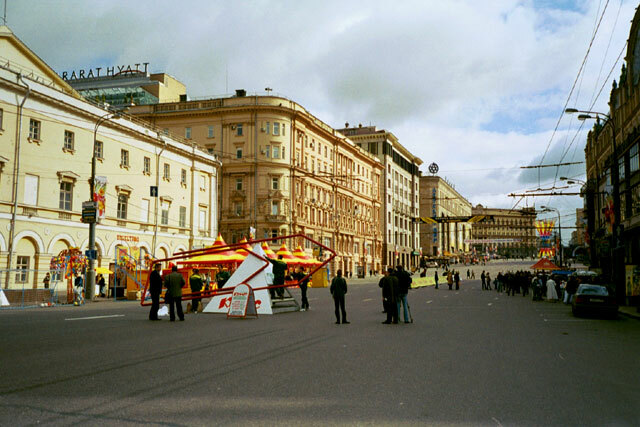 After we leave the Kremlin, we notice as we are walking through the streets, the security has been stepped up and we have to pass through a number of cordons to get around. We spend the rest of the afternoon shopping at GUM and having dinner. It has been a long day and we are quite hungry. At around 6 PM we have to return to the hotel to get ready for our night out at the theater. As we are running late, we have to rush to get ready, leaving the hotel shortly after 6:30 PM. 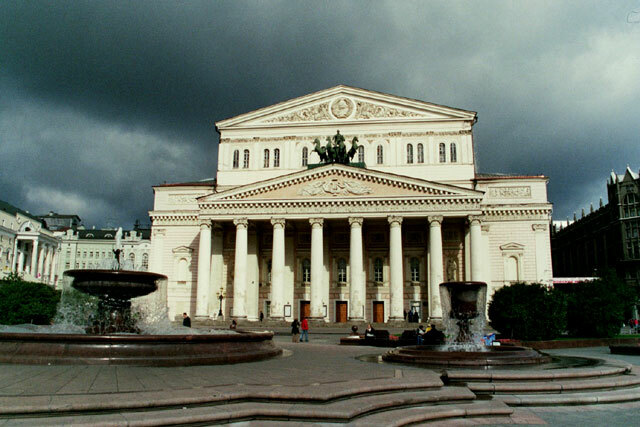 Luckily the walk to the Bolshoy theater is just a few minutes. Once there we have to wait in line for some time for our turn at the extensive security check. We have to go through metal detectors and have our pockets turned out. But it is good - do not want a repeat of the theater hostage situation. Once through the security we find our way to our seats. And what great seats they are. We are in a box at the back in the center right next to the Presidential box. What a great view we have of the theater and stage. As we are waiting for the performance to start, we notice that the stage curtain is the old one from the Soviet days. 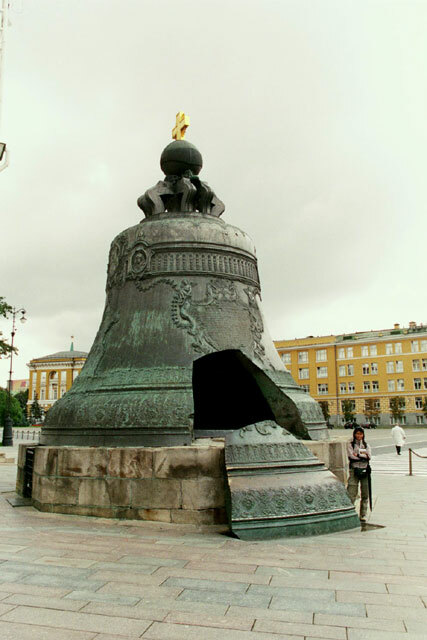 It still has a large CCCP written across it with the usual hammer and sickle. 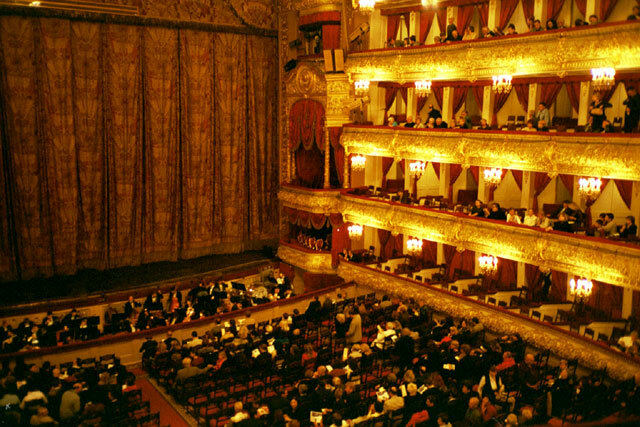 Soon the lights dim and the curtain goes up and we watch a magical performance of a Russian opera called Khovanschina. 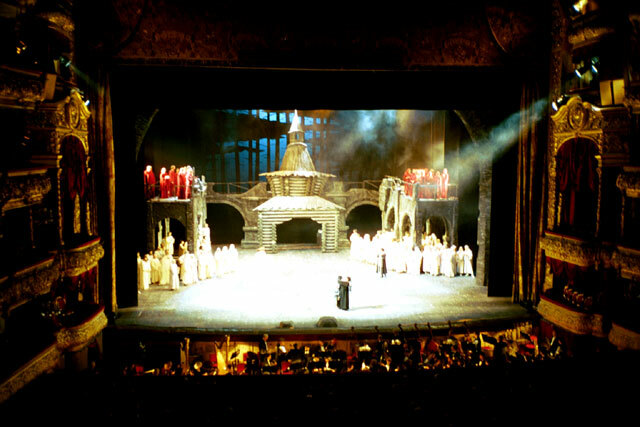 It was all in Russian, but the sets, music, singing and acting were wonderful. With our synopsis we were able to figure out what was going on. After the opera was over, we spent some time wandering around the streets taking in the last of the street festivities before heading back to the hotel.